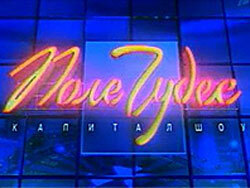 Pole Chudes (Russian "The Field of Wonders") is a Russian variant of the American Wheel of Fortune show. The whole game procedure is very much like the procedure in the Wheel of Fortune, with the players spinning the wheel (or 'drum') and guessing the puzzle by revealing letters in the world. The difference of Pole Chudes from the Wheel of Fortune show is that the puzzles here are connected by the same specific theme, and the question to the puzzle is given beforehand. Prize sector. If this sector comes out, the player may get 750 points or choose to take a secret prize and leave the game. + Sector. The player can choose any random letter in the puzzle and it will be revealed in all cases it appears in the word. Chance Sector. The player having this sector can phone call any random show viewer and ask for clues to solve the puzzle. Bankrupt. If this sector comes out, the player loses all credits and his or her turn. 0 Sector means that the player loses his or her turn. Sector X2. If it comes out, the player may double his or her score by correctly naming the letter. The player may choose to solve the puzzle even before spinning the wheel. If the answer is correct, the player gets highest points for each un-revealed letters in the puzzle. It is also important that the word is pronounced correctly. In case the player names three letters correctly in one attempt, he or she may win additional cash. This option reminds of "progressive jackpot" in Royale Roulette game. To get the cash, the player is supposed to choose between one of the two boxes. One is empty, the other one contains cash. The players who didn't solve the puzzle (or chose to take the prize) leave the game at the end of each round. Winners of the three game rounds play in the final round. The rules are the same. The winner actually wins the whole show. The credits received by the player during the game are used to buy prizes. The winner of the final round may also choose to play in the "Super Game" bonus round. In this round the sectors of the wheel correspond to different prizes. The spin of the wheel determines which prize the player may get. Then the player is supposed to solve the final puzzle. A number of letters chosen by the player may be revealed. Then the player has to solve the whole puzzle in a minute. Correct answer wins the prize, while failure makes the player lose all credits and prizes.